Quest’s Earth Scents enzyme treatment for organic waste is a non-toxic, non-alkaline, non-pathogenic and non-polluting waste treatment. Its enzyme-producing bacteria break down organic matter into water-soluble nutrients. In wastewater treatment, septic tanks, etc. 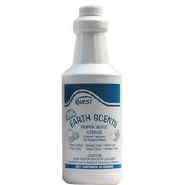 Earth Scents will digest and liquefy grease, food and more. It’s safe for all plumbing and comes in pleasant fragrances.